If you have recently failed and NCT then let Crossings help you out. We are offering FREE INSPECTIONS and ESTIMATES to all cars with an NCT Fail sheet. Just call up 045 897589 and let us know you have recently failed an NCT when making your booking. Make sure to bring your fail sheet with you when bringing your car in for your free inspection and we will conduct a full Vehicle Health Check on your car, and we will give you a FREE ESTIMATE on the work that needs to be carried out to get you back on the road. Our technicians are all Toyota Trained, giving you peace of mind and quality service 100% of the time. If you are prepared for your NCT then there is a better chance of passing first time around. 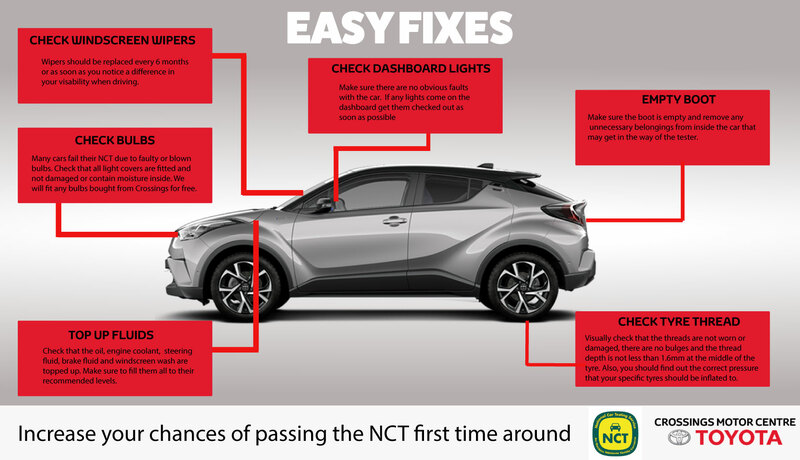 Save yourself the time and hassle of a failed NCT by bringing your vehicle into us for a PRE-NCT check up before the date of the test. If you want to book in for a PRE-NCT we will perform a full Vehcile Health Check and refocus your headlights, as this is something that a lot of cars fail on first time around. A PRE-NCT check up will cost you €30 without a fail sheet. There are a number of things NCT Centers recommend you do before bringing your vehicle in to be tested. If all the below items have not been taken car of then the NCT may be unable to test your vehicle the first time around and you will have to book in for a re-test. If you do find any faults that you’re unable to easily rectify yourself, contact Crossings in advance and we can complete the work required before the test is carried out. Ensuring a pass the first time around. Contact our Service Department on 045 897589 if you have any queries. Don't Painc! Think NCT, Think Crossings.